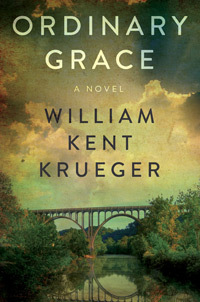 A prior post recorded my delight in the novel “Ordinary Grace” by William Kent Krueger despite my criticism for his use of an Aeschylus quotation about suffering and wisdom. Not surprisingly the book has received many awards. Earlier the novel had won (a) the 2014 Midwest Booksellers Choice Award for Best Novel of the year; (b) the 2014 Dilys Award from the Independent Mystery Booksellers Association for the mystery book their members most enjoyed selling; and (c) the Squid Award from Left Cost Crime , a group of mystery fans for the best mystery set in the U.S. The novel also has been included on many Best of 2013 lists.